Update: Hands-on impressions with the new content added to the end of this piece. Today at BlizzCon 2015, Blizzard revealed what content Diablo 3 players can look forward to in patch 2.4, which is slated to be the biggest patch since Reaper of Souls. Initial hints at new and updated set items, as well as a quickly-edited reveal message that initially mentioned stash space and "set dungeons," all proved true. 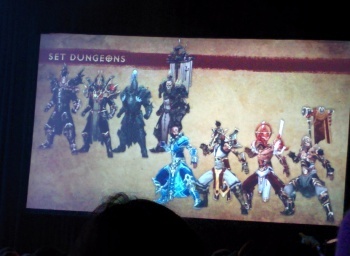 At the Diablo 3 panel, Blizzard confirmed two new areas and one entirely new zone, which will bring with them 16 new monsters. Over 175 new bounties are coming in 2.4, mostly split between acts 3, 4, and 5. Blizzard is also looking to address common player complaints in 2.4. For instance, massive improvements are coming to buff bar UI to address the issue of the overcrowded buff bars making players unable to see all active buffs on their character. Further, the vast advantage that group play has over solo play is being addressed - group play will remain favored, but the gulf between the two will be lessened by reducing the health of monsters in Greater Rifts when there are fewer than 4 players in a party. Additionally, the effect of +XP gear is being heavily reduced at level 70 - for instance, a Ruby that gave 40% increased XP will only give 4% - but to compensate for this, XP rewards across the board are being increased by about 50%. Lastly, the massacre XP bonus from the console version of the game - the incrementing bonus you get for killing hordes of monsters in short order - is coming to PC. A new gold sink is coming to the game in the form of Empowered Rifts, which are like normal Greater Rifts but allow you to spend gold for a fourth chance at rolling an upgrade on a legendary gem. A new Kanai's cube recipe will make this gold sink useful - the recipe allows you to consume legendary gems to buff ancient items. Basically, for every level that the gem has, the item's main stat is increased by 5. Over 50 new legendary items are being added, as well as 10 revised sets, including Invoker's, which will make thorns damage important, and The Shadow's Mantle, which will fulfill the Demon Hunter ninja fantasy as a throwing knife specialist. The Legay of Nightmares two-piece set is being made into a set for builds that don't use sets - you receive a general buff if you have no other sets equipped. Set dungeons are a new feature designed around testing your ability with the game's class-specific sets. 24 dungeons are hidden throughout the world of Sanctuary, each corresponding to a class set. If you can find the dungeon and enter with the correct set equipped, you will then face a series of timed challenges based around the set bonuses. If you beat the challenge, you are rewarded with a unique banner, of which there are 24 - four per class. Beat all 24 challenges and you'll unlock cosmetic wings. Blizzard revealed that season 4 will last four months and is slated to end in late December. Season 5 will start approximately two weeks later and will last three months. No season-specific legendary items will come with season 5, but there will be plenty of cosmetic rewards. A new "rebirth" feature will be introduced with the new season, which allows you to transform an existing character into a fresh version of that character at the start of the season; once the season ends, all progress and items you had on that character will be returned to you appropriately, such as being sent to you mail bag - nothing at all is lost, and your season and pre-season progress will be combined. With patch 2.4, all players will instantly have access to a new stash tab for purchase, with a new stash tab unlocking for completing the season journey in season 5 and future seasons. Players will eventually have access to double the stash space they currently do. Patch 2.4 will hit the Public Test Server some time next week. Update: After some hands-on time with 2.4 at BlizzCon, I tried out a revised set for every class. The Demon Hunter's revised Shadow's Mantle set is extremely powerful right now - its single target damage is out of control, and will likely be tuned down. The playstyle is fun, with high mobility, decent area damage, and huge, rapid single-target damage. The Crusader's revised Invoker set, revolving around thorns damage, was the most fun of the builds I tried. It features high mobility, great area damage, and a unique build option that sees Critical Hit Chance and Critical Hit damage fall to the wayside for thorns damage and attack speed. The Barbarian's Might of the Earth set is now performing powerfully enough, and leaping around while causing earthquakes and avalanches is certainly fun. It lacks the clearing speed of other barbarian builds, but changes could possibly be made to the skill selection to help with that. The Monk's revised Sunwuko set is performing well and felt exactly average relative to all the builds I tested. Changes to the set were made, but it feels like the spirit of the playstyle has been retained. The Witch Doctor's revised Jade Harvester set has brought this build back after it fell out of favor a couple patches ago due to nerfs to Spirit Walk. It felt like it was slightly under-performing relative to most of the other classes, and this may be due to the playstyle requiring a bit more thought and timing. Our testing scenario was Torment 8 difficulty in a bounty area; it is possible that this build is better-suited for Greater Rifts. The Wizard's revised Firebird set distinctly underwhelmed. While certainly beefed up, the heart of Firebird's remains: this set revolves around dealing damage over time. Given the testing scenario was one that best showcased speed-clearing builds, the Wizard sat squarely at the bottom of the totem pole. However, it has the potential to do incredible amounts of damage once it has time to ramp up, so this build may be a star in pushing high Greater Rifts.